Interesting Kidney Facts | Renacon Pharma Ltd.
Risk factors for Chronic Kidney Disease (CKD) include: diabetes, hypertension, high cholesterol, obesity, advanced age, family history of CKD, and tobacco use. Each kidney has about a million tiny nephrons. A nephron is the basic functional unit of the kidney. It has a group of tiny blood vessels called a glomerulus, the small structure responsible for filtering and cleaning blood as it flows through the kidney. Most kidney diseases attack the nephrons, causing them to lose filtering capacity. Interestingly, Kidney diseases destroy the nephrons slowly and silently. The damage will become apparent only years or even decades later. The most frequent causes of Kidney disease are Diabetes and High blood pressure. Other causes include, Glomerulonephritis (inflammation of the glomerulus) and Polycystic Kidney Disease (an inherited disease, causing large cysts to form in the kidney). What most people don’t realize is that taking over-the-counter pain-relieving medicines, can also result in Kidney disorder. Please keep in mind that these medicines can be toxic to your Kidneys and may even provoke some serious damage. Dialysis is the most common therapy for people suffering from end stage kidney failure. There are two types of Dialysis – hemodialysis and peritoneal dialysis. In hemodialysis, an artificial kidney used to remove waste, extra chemicals and fluid from your blood. The cleansed blood is returned to your body in a continuous circuit. Hemodialysis is the most common way to treat advanced Kidney failure. Typically it requires three treatments a week in a monitored dialysis center. The procedure may last up to three or four hours. In peritoneal dialysis, your blood is thoroughly cleaned within your body. What happens is your doctor places a plastic tube into your abdomen to make access. Sterile fluid is infused and wastes and excess fluid are removed. Peritoneal dialysis is done daily at home. Dialysis and Kidney Transplantation can extend the lives of people with Kidney failure. Fortunately, there are ways to prevent Kidney disease. Kidney-related disorders usually occur gradually over time. That’s why it is always better to identify potential disorder early on. Time is of the essence – early detection can slow the progression of CDK and protect your health. 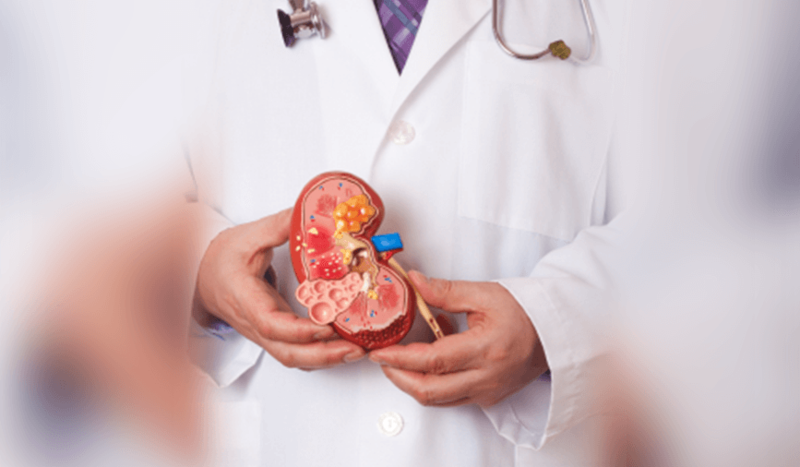 Kidneys are vital organs, performing some of the most important functions in our body. They are sophisticated processing machines that keep our blood clean and chemically balanced. It goes without saying that the more you know about your body and your health, the more control you have over your life. Following are some interesting information pertaining to Kidney disease and Kidney health. Our Kidneys have a higher blood flow than our brain, liver or heart. The Kidneys absorb and distribute 99.9% of the blood volume. Only 0.1% of the blood filtered turns into urine. Each Kidney is about 5 inches long (13 centimeters) and weighs approximately 4 to 6 ounces (120-140 grams). The Kidneys filter almost 200 quarts of blood every day. 1 in 9 adults in America, or at least 26 million Americans, have Chronic Kidney Disease (CKD) and millions more are at increased risk. According to The American Society of Nephrology, the number of people diagnosed with Kidney disease has doubled for the last decade. I would strongly recommend blood and urine tests to detect early signs of the disorder. Heart disease is very common among people with Chronic Kidney Disease. CKD patients are more likely than the general population to develop heart condition. That’s why following all the necessary steps to prevent heart problems is absolutely crucial. What they should do is eat healthy foods, exercise on a regular basis and kick a smoking habit (in case they smoke). CKD patients should cut down on foods that contain saturated fat, such as eggs, milk, cheese and fried foods. Healthy foods rich in omega-3 fatty acids should become a part of their dietary regime. I cannot stress enough the importance of salmon, albacore tuna, sardines, walnuts or flaxseed oil in your diet. Patients with kidney dysfunction commonly develop anemia as a result of decreased hormone production in kidneys. Anemia can result in fatigue and a diminished functional status. Those with CKD and anemia can be treated effectively with medication. Kidney failure is not always permanent, which is great news for many people. In some cases of acute kidney failure, the kidney function returns with conservative management. Unfortunately, most causes of kidney disease are more insidious. They can progress slowly but steadily and without the proper management can lead to end stage kidney disease, requiring renal replacement therapy. Only one donated Kidney is needed to replace two failed Kidneys. The life expectancy of someone who donates a kidney is the same as the general population. There is no increased risk of kidney disease if a well-screened person donates a kidney to someone who is in need of a transplant. Although most back pain has nothing to do with the kidneys, some kidney-related conditions could lead to back ache. The most common root of kidney-related back pain is a kidney stone. Please note that infections could be a less common but potentially serious cause of a kidney disorder. If you experience dull one-sided pain in the upper back, accompanied by fever and urinary symptoms, you should contact your healthcare provider. This may be a sign of a serious condition.